Police arrested and charged a Gordon man with indecent exposure on Tuesday morning (25 September) and are investigating whether the incident is linked to the escalating number of child approaches across the ACT and in Queanbeyan. A 43-year-old man will face the ACT Magistrates Court this morning (26 September) charged with committing an act of indecency on a child after he allegedly exposed himself to a 12-year-old school student yesterday. Police said a 12-year-old girl was on her way to Lanyon High School when she was allegedly approached by the 43-year-old man in Conder. After a brief conversation, the man allegedly exposed himself to the girl. The girl ran from the scene to her school and told parents and teachers who then called Taskforce Tydeus detectives. The detectives then arrested the man, who was in the vicinity. Detective Superintendent Scott Moller said the quick call to police from the school was crucial to police being able to make an arrest. “The urgency with which we received those complaints definitely yields results for us,” he said. “That was the most crucial part of the investigation. Detective Superintendent Moller said it was too early to tell if the case was linked to the 17 other child approach incidents since February, but would not rule it out. He said the taskforce was following a lot of leads and said the arrest was a positive step for Taskforce Tydeus. Police also revealed another student was approached by a man driving a white ute in Wanniassa on Monday afternoon (24 September) while waiting to be picked up from school. The man is described as Caucasian, between 40 and 50 years of age, with shoulder length hair, a large ear piercing and a long full face beard. Police have now released seven face-fits into the 18 incidents since February but would not say if the man charged resembled any of the face-fits. LIVE from City Police Station where Detective Superintendent Scott Moller will reveal Taskforce Tydeus – a dedicated taskforce to handle the escalating number of incidents of men approaching children in the ACT – have arrested and charged a man. 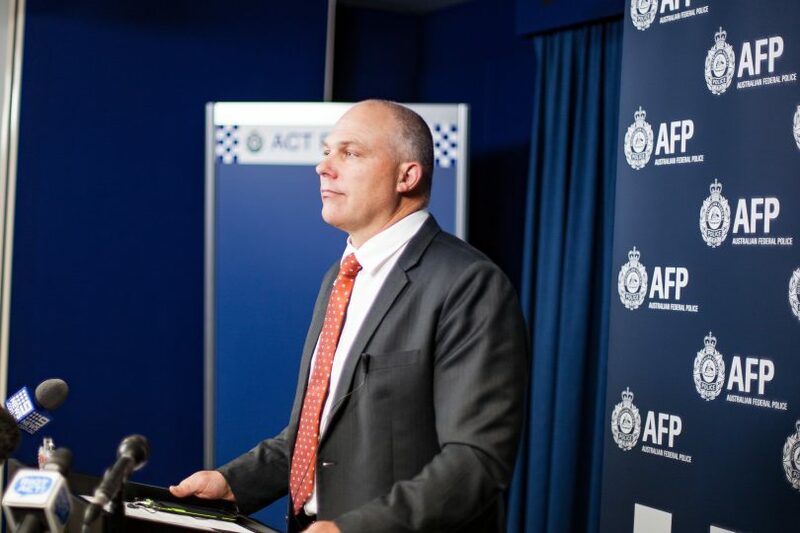 An ACT Policing spokesperson said Taskforce Tydeus was taking all reports seriously and would examine all available information in order to identify suspects. Police are also patrolling schools in the Canberra region. Police are encouraging parents, guardians and teachers to make sure children understand how to keep themselves safe, particularly when walking to and from school, and to teach children about stranger safety. Information on ways to help children to stay safe is available on the Constable Kenny Koala website. Police said they were reviewing all reports of child approaches received since February and were asking anyone with information to email Op-Tydeus@afp.gov.au. If you become aware of an incident or notice anyone acting suspiciously around a school or child, contact police immediately on 131 444 or in the case of an emergency call 000. Anyone who may have any information that could assist police can contact Crime Stoppers on 1800 333 000. Please quote Taskforce Tydeus reference 6269577. Information can be provided anonymously. So glad theyve caught one person! You probably right but time will tell. Give them the benefit of the doubt till score card in. A good result. Glad it will be an ACT Court and not Victoria.